You are starting with a blank product. Customize your coconut product by entering design code number and the text to appear on the coconut. If design code area is not filled in, we will choose the design. Submit a quote for custom designs. Scroll down for other products and sizes. 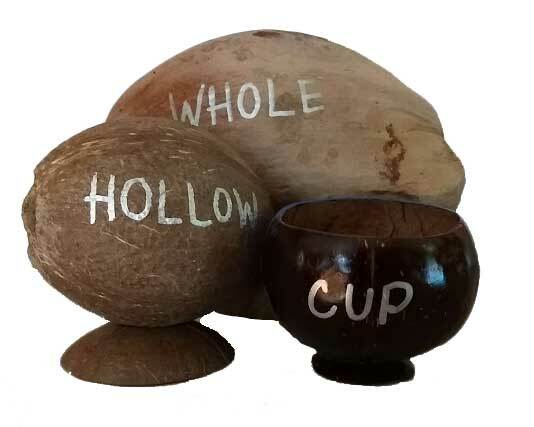 NOTES: Hollow coconut is shown with optional stand. Whole coconuts offer an optional stand also. We use the cup inverted, as a stand for whole coconuts. Sunset blended colors will have darker color on bottom in two-sided designs. You are starting with a blank whole-sized coconut. Design it below. If design code is not entered, we will ship design of our choice. We do not include text from design code references, only the background design. Add your text below. Painted Whole size Coconut sent without a box! Please note that the paint may chip if shipped without a box. You are starting with a blank hollow coconut. Design it below. If design code is not entered, we will ship design of our choice. Painted on a horizontal orientation so coconut can sit on it's side with or without a stand. These are natural items, safe for food and drink 4-6 inches in length. Hand wash only. You are starting with a blank coconut cup. Design it below. If design code is not entered, we will ship design of our choice. These are natural items, safe for food and drink. Handwash only. You are starting with a blank coconut shell. Design it below. If design code is not entered, we will ship design of our choice. You are starting with a blank hollow coconut. Design it below. If design code is not entered, we will ship design of our choice. Painted on a vertical orientation so coconut can hang or sit upright on a stand. These are natural items, safe for food and drink 4-6 inches in length. Hand wash only.